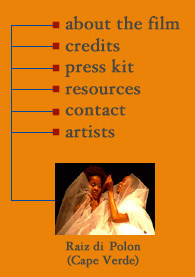 Raiz di Polon was founded in 1991 in Cape Verde, as one of the many dance companies of the archipelago. In 1994, the company encountered European contemporary dance, through the project and performance Dançar Cabo Verde, led by Clara Andermatt and Paulo Ribeiro, and were fascinated. From there on, the members of Raiz di Polon embarked on a difficult, but extremely interesting journey, looking for new grounds and possibilities for Cape Verdian dance, amongst others through the project DANÇAR O QUE É NOSSO, developed in collaboration with DANÇAS NA CIDADE. 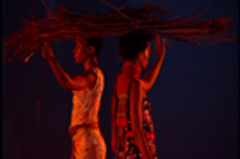 Duas Sem Três (a colloquial pun for a woman's lost virginity) is the first choreographic collaboration by Rosy Timas and Elisabete Fernandes, members of Raiz di Polon. Inspired by Duas Sem Três, a literary piece by the Cape-Verdian musician, composer and writer Mário Lúcio Sousa, the dancers create their own universe on the stage. Speaking, singing, and using branches, broom, and buckets as props, the duo allows for the multiplication of body language, rhythms and sonorities while conjuring a fragile, yet comic, sensual world.